So the next night Tverbul it was, the feted restaurant opened by Ksenia Sobchak and chef Anatoli Komm and developed by Ginza Project, together three pretty big names in Russia. This is the A-list Ksenia, some might say the Paris Hilton of Moscow, daughter of the popular former mayor of St Petersburg and one time boss of Vladimir Putin. Anatoli Komm is the founder of some of Moscow’s most expensive restaurants, and the local practitioner of molecular cuisine, which to me means foam, or the art of serving air to customers. Like Ksenia, Ginza Project has moved to Moscow from St Pete in a big way, developing a dozen or so restaurants and clubs since the crisis. Tverbul is located about 100 meters down from Cafe Pushkin (50 past Turandot) in a historic building that according to the management was home to Rimsky Korsakov, and location for production of the Soviet Union’s vinyl gramophone records by Melodiya. Ksenia first opened Bublik on the first floor, a small bakery-cafe, and more recently Tverbul on the second floor accessed from the side of the building. The stairway opens out into large dining areas. When we arrived at 6:30 on a Tuesday, it appeared we had our pick of tables, but apparently most were reserved. Probably our Ortega-PASSPORT credentials got us a great table, just where John specified next to the wall-length glass partition that separated the open kitchen. By 9:00, Tverbul was hopping with not a free table in sight. Tverbul’s renovation and decoration is impressive and tasteful. The original structural brick walls have been exposed and preserved. The brick in these old Moscow buildings is just the right shade of burnt red-orange providing a handsome backdrop for other natural materials. Menu and wine list in hand, I asked after the chef. “Anatoli Komm,” answered the waiter. “Impossible, who is the real chef?” I challenged, him and then a manager. We were finally informed that Komm was the Executive Chef; the chef on duty was Vladimir. The wine prices were predictably cosmic—the Antinori Cervaro della Sala that I use for a wine list price gauge was 8,500 rubles—a markup index of 4.25. I was delighted to find the California Seghesio Sonoma Zinfandel that placed seventh on Wine Spectator’s Top 100 list in 2008, but the price was 5,500 rubles, more than four times the retail price at Kauffman. There were just a few red and white wines by glass starting at 350 rubles a glass for a Mondavi Twin Oaks Chardonnay. John ordered the usual starter tasting array for the table: Kamchatka Crab Salad with New Cabbage (1,050 rubles), Sea Scallops with Black Truffle Sauce (950 rubles), Octopus Salad with Sweet Dressing and Cherry Tomatoes (980 rubles), Beef with Black Truffles and Aged Balsamic (650 rubles), and Tuna Tartar with Strawberry and Avocado (620 rubles). The octopus, tender morsels combined with boiled potatoes, red onion and cherry tomato with a very light and delightful dressing, was the most memorable dish. The tuna tartar was good—an unusual combination ingredients diced small. Unfortunately, the very good, single large sea scallop came out under a detracting, very aromatic, frothy truffle foam. The black truffles didn’t do much for the beef either. We added a Home-made Cheese Pie (350 rubles), a large very pleasant flat baked pastry. Around the table the main courses included Pappardelle with Rabbit (650 rubles), Tverbul Burger with Black Truffles and Foie- Gras (800 rubles), Free-range Chicken with Alderwood Smoke Aroma (650 rubles), and my selection, Taglioni with Kamchatka Crab (950 rubles). The burger was lady-sized, served open face topped with arugula. My taglioni was very good with a generous cheese sauce, but I was expecting at least a couple of pieces of crab rather than shredded crabmeat. Shiraz Mamedov, who as one of Russia’s largest poultry importers is our regular meat expert, ordered the free-range chicken. Though relatively small, it looked delightful, grilled and glazed golden. Generously, Shiraz shared around the table—luscious it was even better than it looked. Shiraz said the chicken must be from a local supplier. 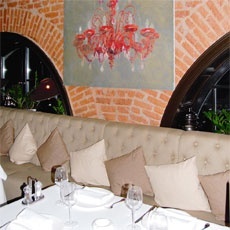 Tverbul is a very good restaurant, but its high scores on décor and atmosphere, exceed the count on cuisine. For now it’s one of Moscow’s trendiest haunts, the type of establishment that La Petite Maison could only now dream about.